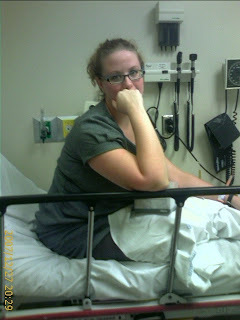 Well, I know I said I wouldn't go but after a good threatening from my parents, I gave in and went to the ER at UAB. We chose UAB because we figured that they would have the most comprehensive care for someone pregnant and sick. What we didn't know however, is that even at the ER, they don't treat pregnant people! 7:20pm-We walked in to the ER and were asked if I needed to see a doctor. I said yes. The man at the desk then asked what my problems were and I told him about having a sinus infection and not being able to get seen by any other doctors since I am pregnant. At that point, a blank stare came over his face and he called over a supervisor. They told me to have a seat in the triage room and the nurse would be with me ASAP. A nurse came in and did the triage and then said that they would more than likely be transferring me to "MEU" (Maternity Evaluation Unit) since I was past the 16 week mark. I was then immediately moved into another room and was set up with a fetal heart monitor and a doctor came in within 15 minutes. (I have to say this was the speediest I have ever been seen and dealt with at any ER!! ---especially since the waiting room was completely packed-probably 100 or more people in there) The doctor came in and listened to my chest and said I would definitly be transferred to the MEU. Within about 10 more minutes, I was being wheeled through the corridors of the hospital. 2 skybridges and 3 elevators later-We ended up in the MEU approximately 2 BLOCKS AWAY FROM THE ER. How we got there I do not know. I was seen by 2 nurses who didn't know why I was there and then I was seen by a resident. During the exam by the resident-more fetal heart monitoring, etc-she was paged to go catch a baby, so she left. About 1 hour later, I was seen by the Fellow and the Resident again, who said that I needed a shot of steroids and then I could go home. At this point, mom showed up--I have no idea how she found us b/c we didn't have a clue where we were in the hospital and all Jesse had told she and dad was that they were moving me to MEU. We waited for about 1 more hour and then the nurse came in and gave me a shot. I packed my things and we headed for home. 12:00am-total time in ER/MEU-4 hours 40 minutes. 3. Dropping the word "pregnant" in the ER actually got us seen faster! 5. Jesse is a great bedside nurse-he went and got mom and I milkshakes while we waited on the shot and discharge papers! (he obviously knows the way to my heart-Milkshakes & French Fries!! Now, if we could just get Jesse well, we would be good to go!